waiting list currently until december 2019 from october 1st 2018 a 15% increase in price will apply to all items to offset rising costs. 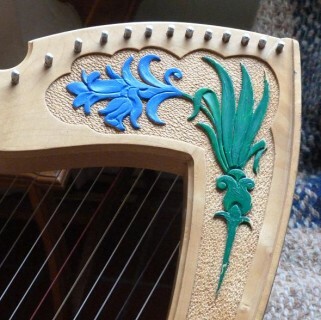 note, no prices are quoted on this page as all the harps are individually designed and are usually once/off orders .Therefore the prices can vary by big margins. 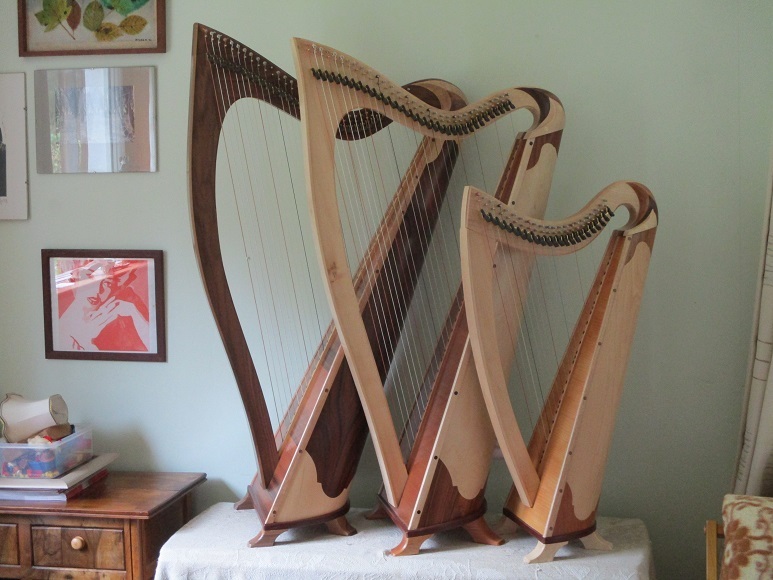 the two harps at the top are just finished.The dark one is a ” New Antwerp” model in walnut with a” Santos rosewood “veneered back ( Decoflex paper/ backed veneers)and the lighter one is sycamore “32 counties”. 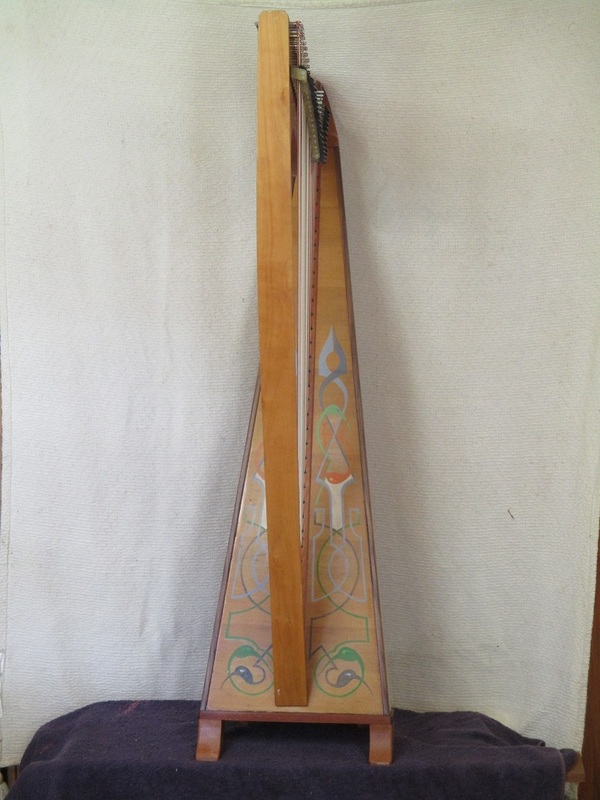 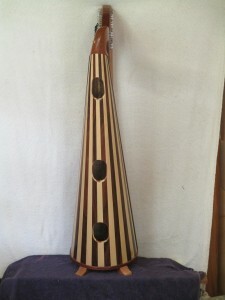 This is a cherry wood harp I made in the early nineties and recently had the pleasure to see again for a service .The back is veneered with rosewood and maple (paper backed real wood veneers ) covering the cracks that were filled and repaired with solid wood.The design is oil paint under the varnish . 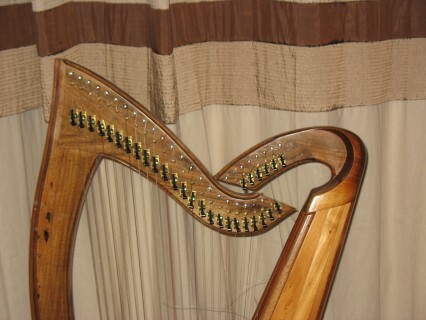 This is an example of combining a standard/harp harmonic curve with a semi pro sound box as made at that time. 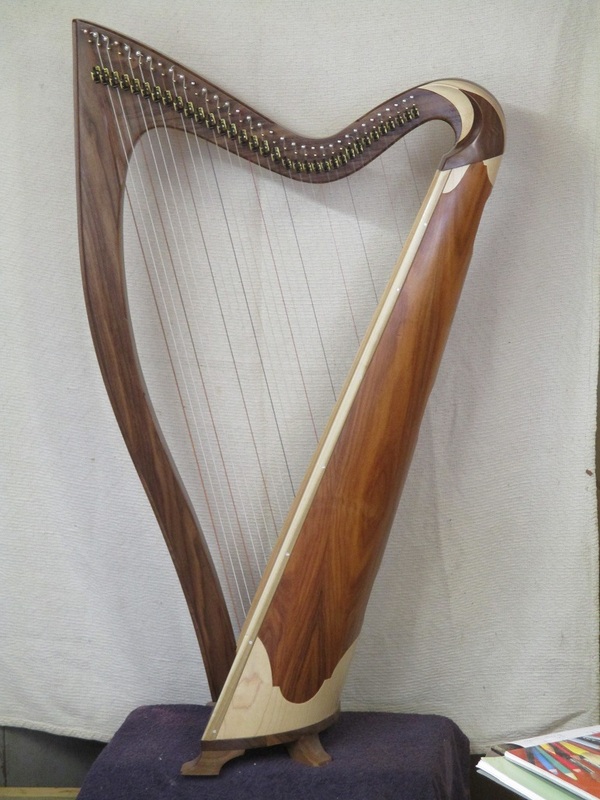 Please visit and enjoy ALL the pages on this website ( in the left hand margin of the opening page) and see the variety of items on offer. ALL are made by me and I’m not acting as an agent or a shop for goods made somewhere else by other suppliers. All model names are registered and listed under my name .Be wary of so called good offers of Irish harps on certain websites as many of these instruments are not suitable for playing .If in doubt call me and I will advise you free of charge on the value of these instruments . 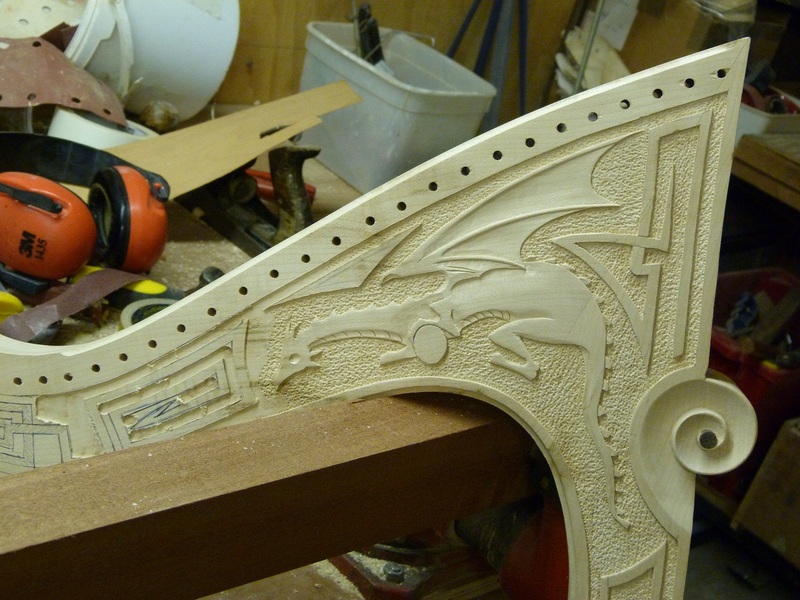 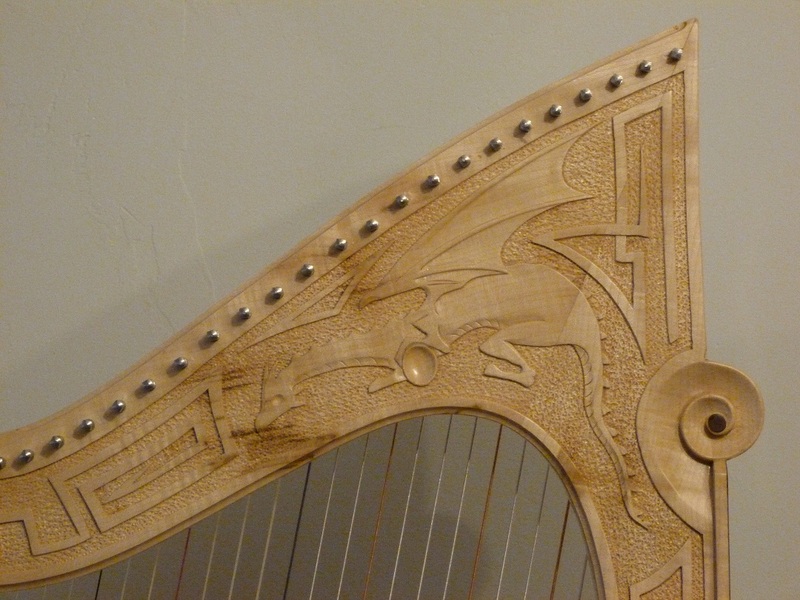 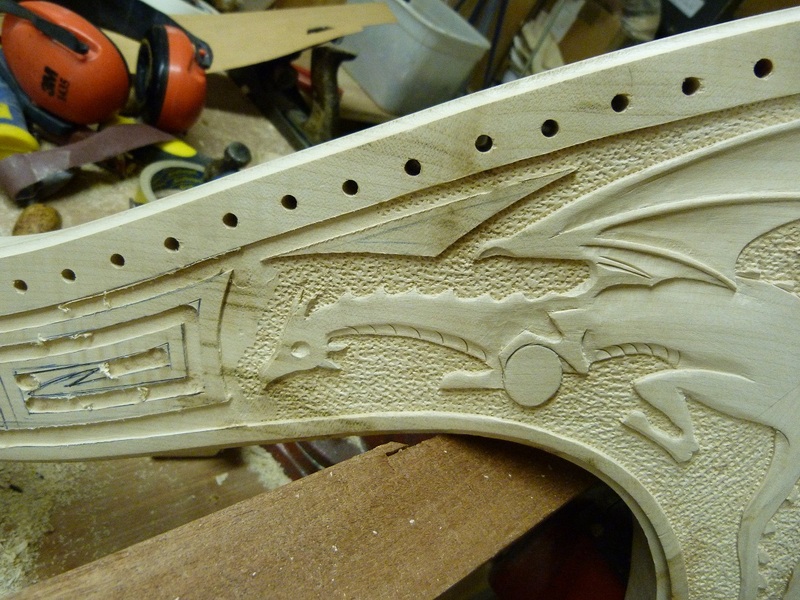 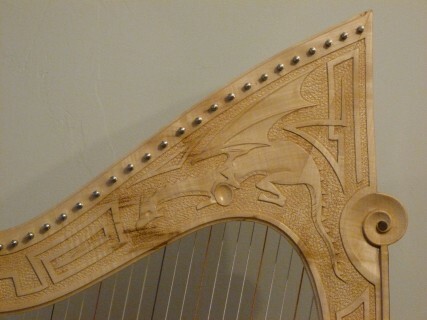 A 35 string harp for Spain , special request ,complete with dragon ! Irish Sycamore .Note the variation in the colour due to minerals in the wood.This often happens in sycamore and some other species. 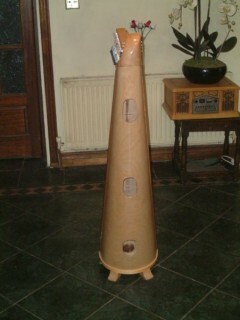 It adds to the surprise ! The soundbox is veneered with rosewood and cherry , the design for the carving was done by the client on the template provided by me through the post. The veneers are paper backed and made by “Decoflex Belgium” this material is real wood but never cracks while cutting and bending and never moves during or after installation as the layer of paper onthe reverse side is permanently bonded. 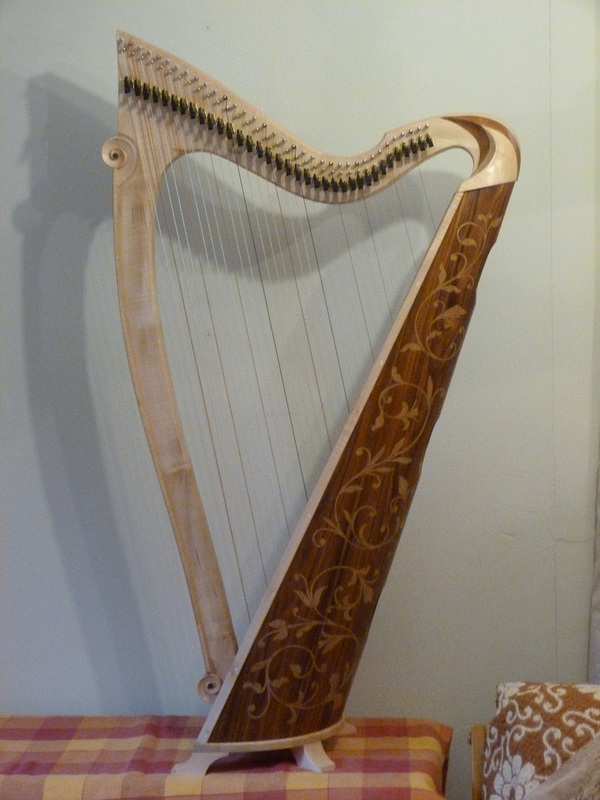 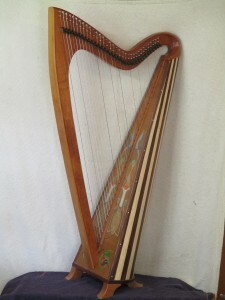 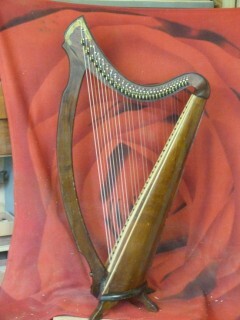 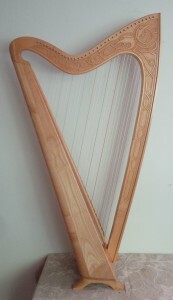 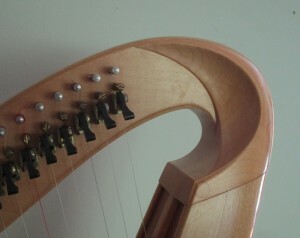 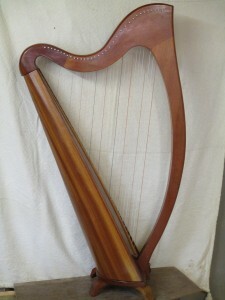 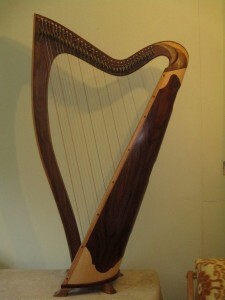 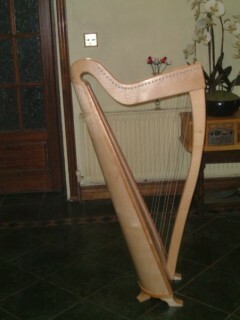 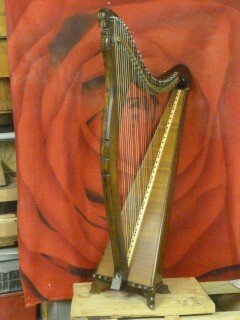 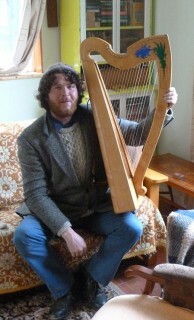 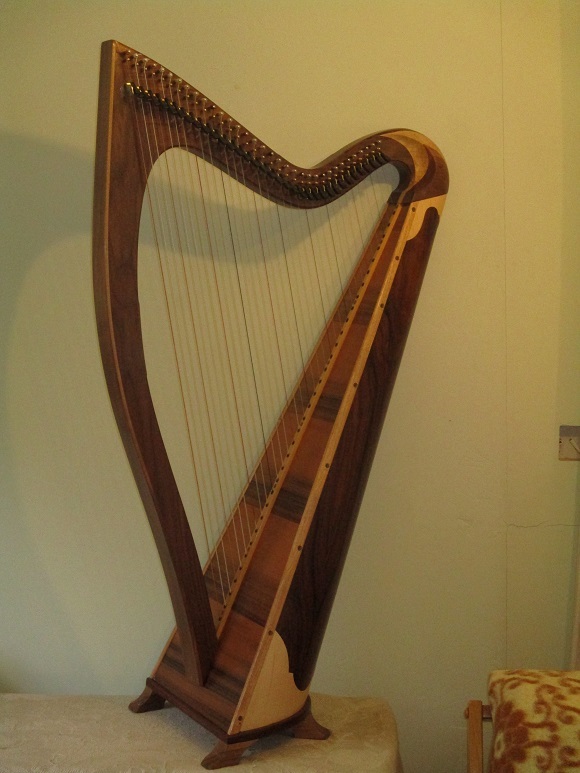 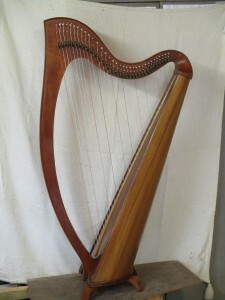 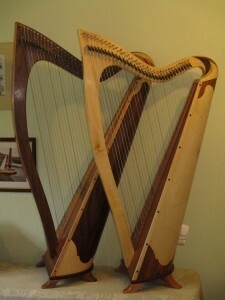 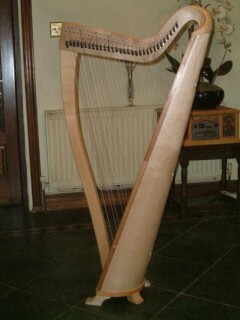 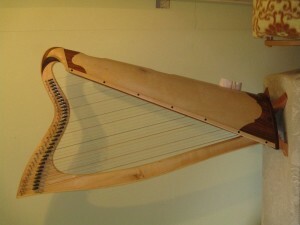 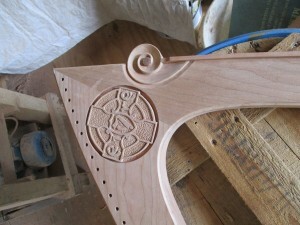 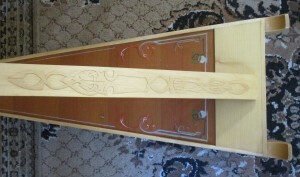 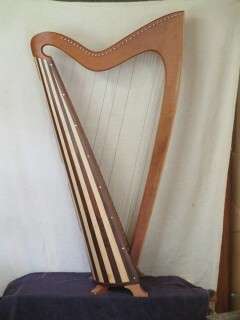 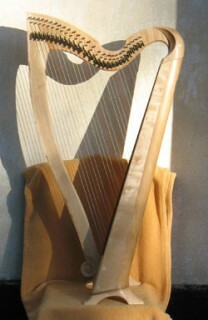 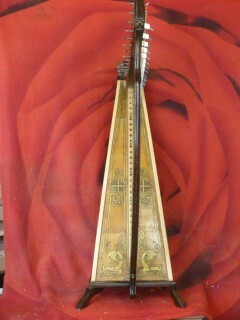 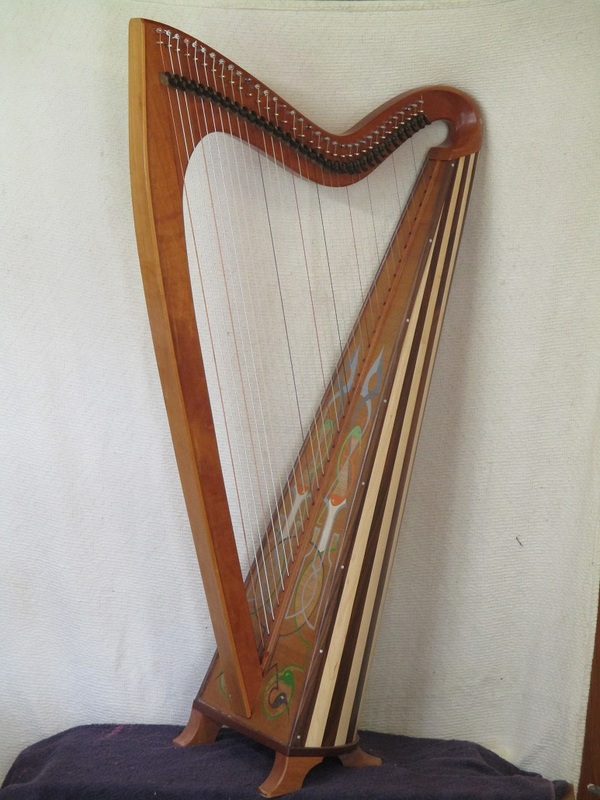 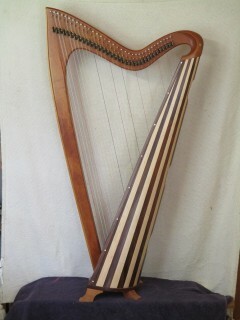 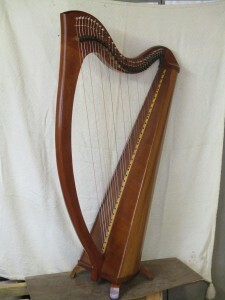 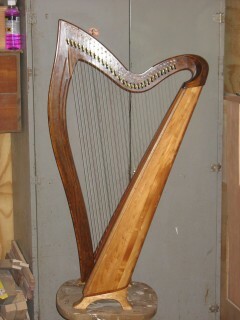 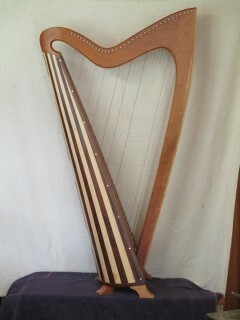 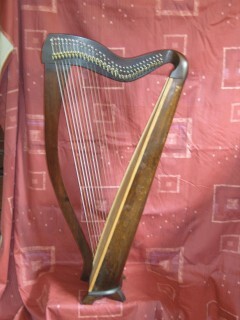 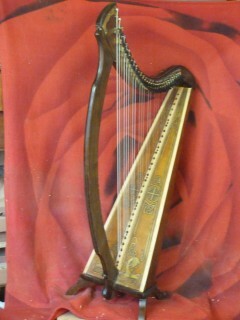 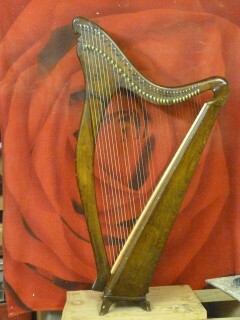 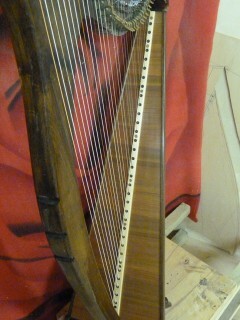 this lovely harp was made by my friend Larry Egar in Cork . The owners contacted me with a view to a complete overhaul . 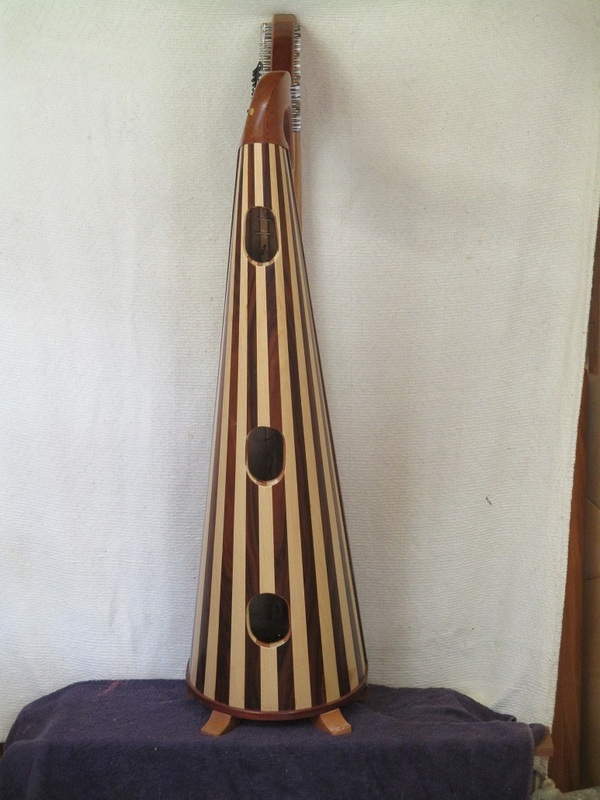 I added ebony discs on the sound board bridge strip and repaired the crack in the harmonic curve at the shoulder.Out of respect I also finished in the same fashion with french polish as the original. 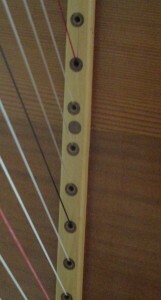 New levers by ” Loveland “replace the old brass ones and a full set of carbon strings replace the old nylon . Sounds really nice now and it’s like Irish harps should be, light to carry , simple design with gentle action and sweet sound… None of these massive ” reduced concert harps” with high tension and needing a body builder to carry it around and a small van to get there! 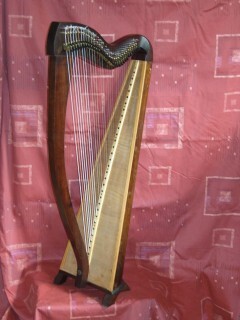 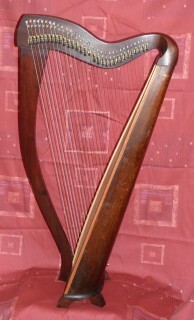 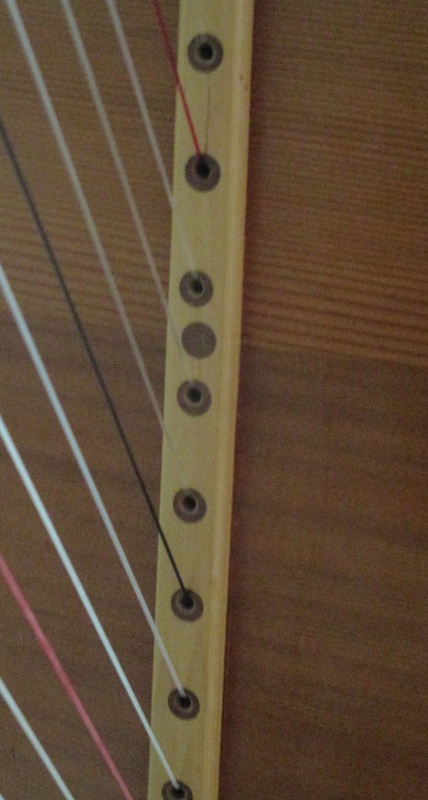 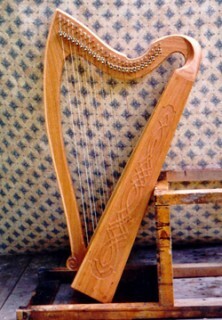 27 string model made as standard harp. 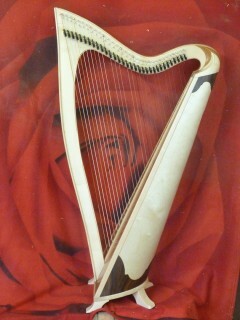 26 string model Solid soundbox with carving. 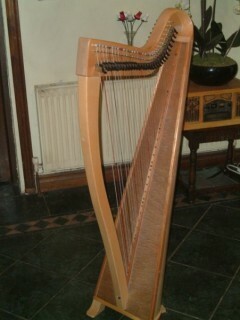 this is a poor broken harp!!! 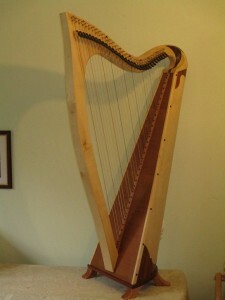 this way they sometimes come back to me, I made this harp about 30 years ago and it had an accident.the repaired harp is also shown, and the sound was just as the old one.Great relief all round! 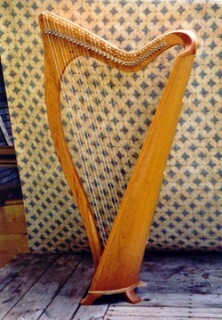 this is the " new " version of the old harp.